Taking it to the limits. 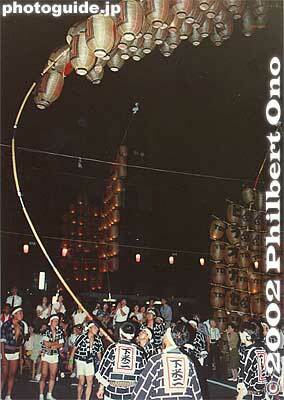 This guy is balancing a super-high kanto while the pole arches to an extreme degree. During the final moments, he ran across the road to maintain the balance long enough for the pole to snap under the weight of the lanterns. That was really neat. In the right photo, a crashed kanto is readied for another balancing attempt.